Discover the golden sands and crystal blue seas of Florida’s coast on this excellent 12 day self-drive tour. Starting in vibrant Miami with its famous South Beach, fabulous shopping, fun bars and excellent restaurants. 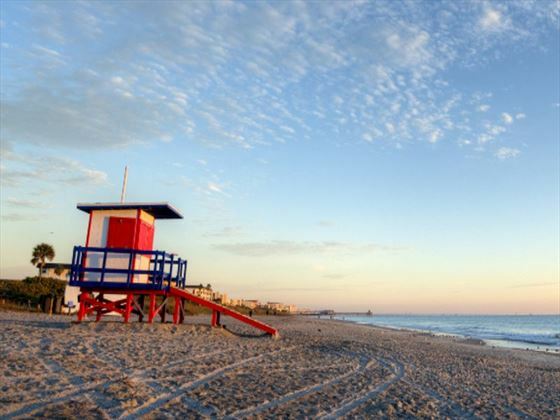 Travel to the beautiful barrier island of Cocoa Beach, with its pristine white sands, then head north onto historic St Augustine, home not only to beautiful beaches but a place which also lays claim to being the nation’s oldest city. Next you’ll head over to the Gulf Coast and the seaside resort of St Pete Beach with its myriad attractions. Travel south to Naples which combines beautiful beaches with championship golf and world-class shopping, and finally end your Floridian adventure in iconic Key West. This is a tailormade tour, so we can change the hotels, route and durations to suit you. 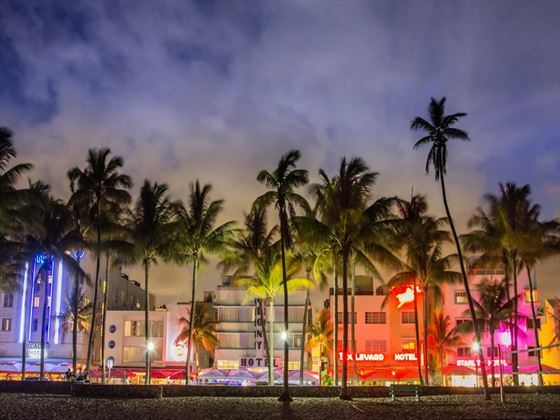 Begin in Miami with two nights, 1 night Cocoa Beach, 2 nights St Augustine, 2 nights St Pete Beach, 1 night Naples, and finish with 2 nights in Key West. 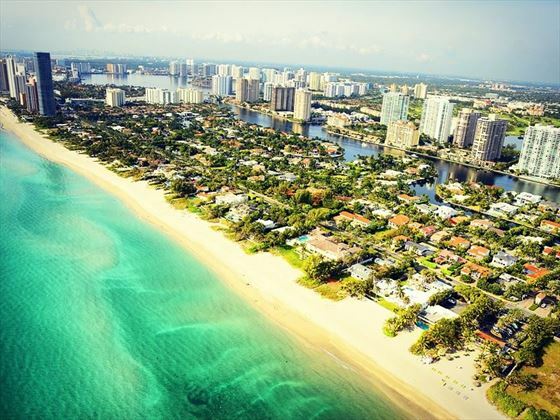 Arrive in Miami Beach where you will have two days to explore the vibrant city and all it has to offer. Pick up your hire car and enjoy the art deco vibe at Miami Beach, explore the bustling open-air markets of Little Havana, or visit the glamorous city of Coral Gables. 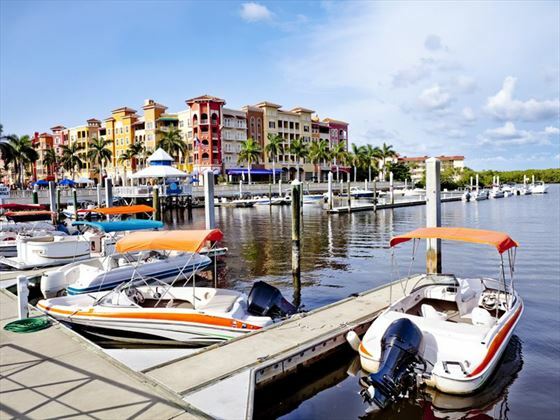 Whilst driving to Cocoa Beach, stop off at the delightful resort town of Palm Beach. You’ll have a fun few hours here with tropical Palm Beach Zoo, the capitivating Flagler Museum and beaches that are perfect for snorkelling. 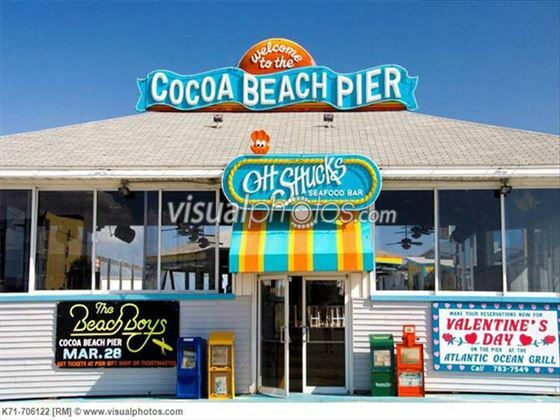 Once in Cocoa Beach head to the pier to enjoy sumptuous restaurants, cool boutiques and entertaining live music. 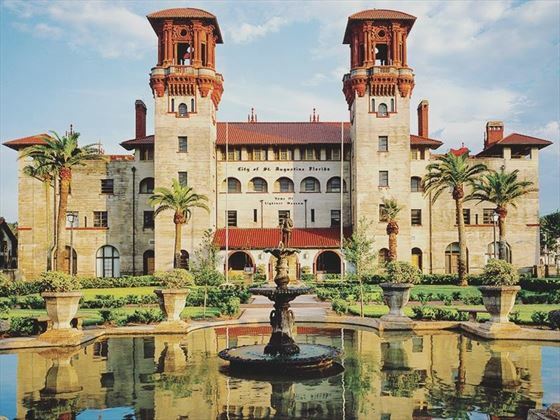 Drive along Florida’s scenic Gold Coast to the lavish, Spanish-colonial St Augustine, filled with centuries old architecture, horse-drawn carriages and hidden courtyards to explore. 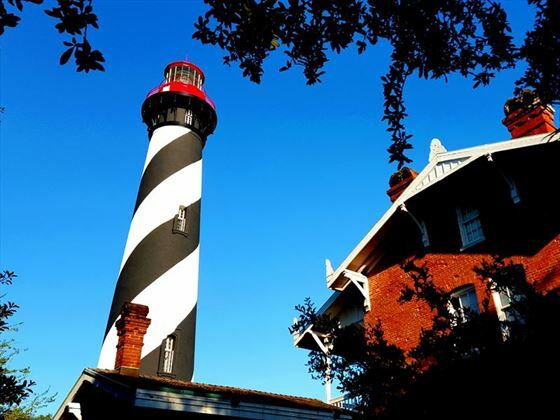 Not just known for its history and European flair, there are plenty of gourmet restaurants, gorgeous beaches and great shops to venture to in St Augustine, too. 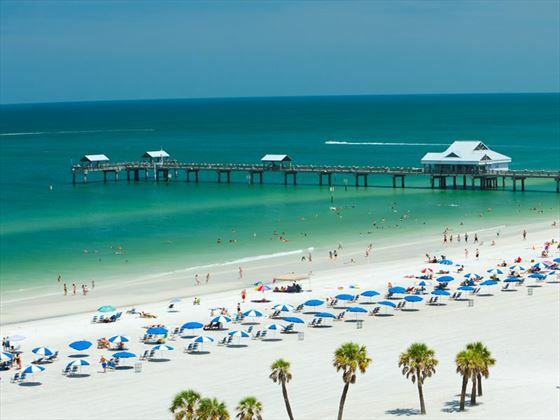 Your next stop is St Pete / Clearwater which has been consistently voted one of the best beaches in America for many years. With miles of pristine beaches, sparkling gulf waters and clear blue skies. 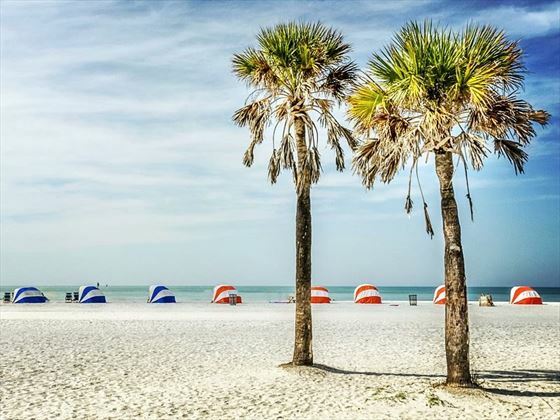 There are an abundance of recreational activities to enjoy in the area, including the stunning, family friendly Fort De Soto Park, the contemporary St Petersburg Pier, and the fascinating Dali museum. Saunter across the Tampa Bay on the spectacular Sunshine Skyway bridge, before continuing south through the charming towns of Longboat Key and Sarasota; home to Sarasota Jungle Gardens and Siesta Key. Soon you’ll arrive in Naples, which offers unspoiled beaches, stylish boutiques, art galleries and lovely restaurants. 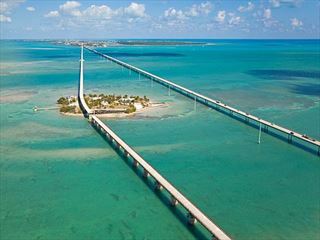 Start your day with a journey over the magnificent US Overseas Highway 1, which links mainland Florida to the 120 mile long Florida Keys. 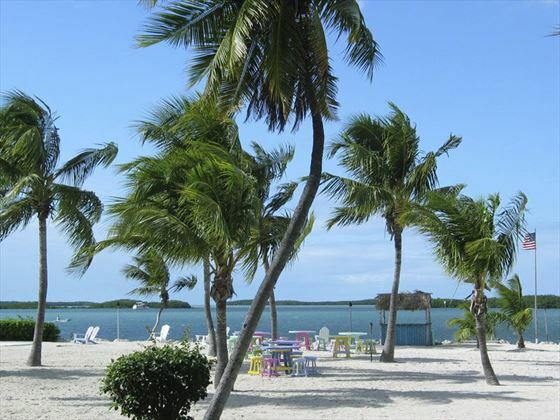 On your way you’ll drive past vast grasslands, bottomless marshes and the exotic Everglades before your arrival in the eccentric Florida Keys. Discover charismatic conch houses as you wander the palm-lined paths, taste tangy Key Lime Pie and visit Hemingway’s fived toed cats at his home, all before joining the Sunset Celebration on Mallory Dock. Today your adventure ends, drive back to Miami airport and return your hire car for your departing flight. Daily direct flights available from Heathrow with Virgin Atlantic and British Airways. Regional connecting flights also available. Weekend flight supplements apply for departures on a Fri/Sat/Sun. 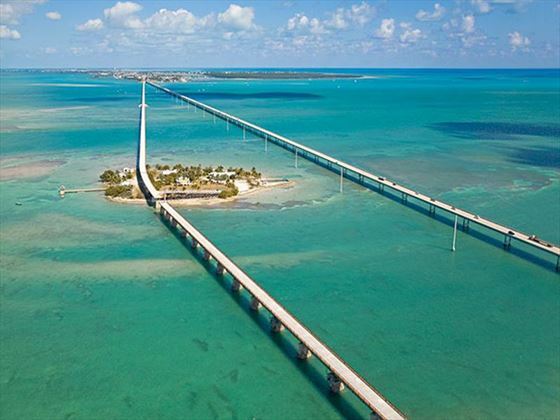 Explore all that the fascinating Florida Keys has to offer in this exciting fly-drive escape featuring mesmerising Miami, beautiful Islamorada & quirky Key West. This great getaway explores the highlights of the Sunshine State, combining the culture of Miami, sophistication of Naples & history of Key West into one brilliant journey.